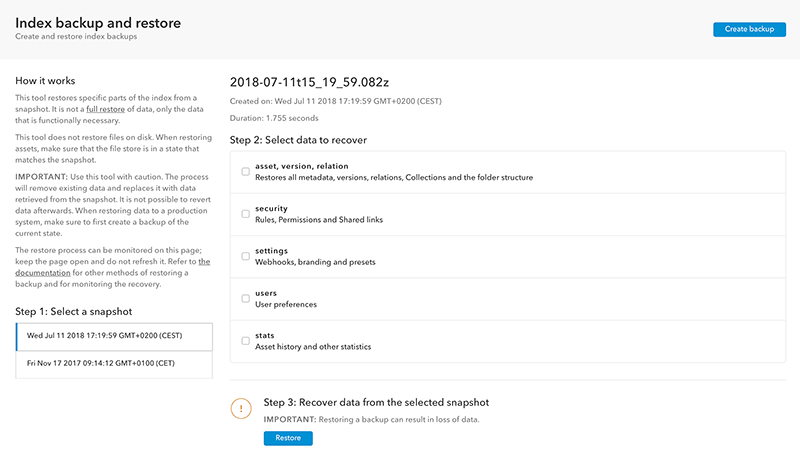 It is recommended to regularly create a backup of the Elasticsearch data in Elvis Server so that it can be restored when experiencing issues with the system. This article describes how to restore backups and provides information about rescuing index entries in case these were lost during the restore process. For information about how to create or delete a backup, see Creating or deleting a backup of the index in Elvis 6. Backups are referred to as 'snapshots'. When restoring an index in a new installation of Elvis, make sure to first deactivate the license in the previous installation as described in Uninstalling Elvis 6 Server. Step 3. Find the snapshot that matches the date that you want to revert to. Note: By default Elvis creates snapshots during the night, so the date listed will likely be before the start of the work day. Step 4. Copy the value from the "snapshot" property. In the example above, this value is 2018-06-07t01_00_00.00.002z. The steps below describe how to remove all existing data and how to put back the full data from a snapshot to the index. This typically needs to be done when restoring data on a clean installation. The steps below describe how to put back the full data from the backup to the index. Step 1. Remove all existing indices from the server by using the commands below. Important: The following command is destructive and cannot be reverted. Values listed under files_percent all need to be 100%. If values are lower than 100%, retry the command after an interval and check the values once more. Step 4a. Shut down all nodes in the cluster and make sure that they are all properly shut down. Step 4b. Start all nodes again. The server will be restored and available for use. The steps below describe how to put back one or more specific indices from the backup to the index. This typically needs to be done when the index or its data has been compromised. Restoring specific indices can be done by using the Management Console or by manually entering commands in a terminal. Info: This feature requires Elvis 6.18 or higher. Access the 'Index backup and restore' page in the Management Console and follow the instructions. Step 1. Make sure you have selected the correct snapshot and the indices that you want to restore including the -r1. Step 2. Remove the selected indices from the server by using the commands below. Step 2b. Remove the specified indices, using their aliases. The postfix -r# is not included here. The command below uses the example of removing an asset, version and relation. Make sure to use the correct names for your situation. Step 5a. Shut down all nodes in the cluster and make sure that they are all properly shut down. Step 5b. Start all nodes again. The server will be restored and available for use. To validate if a repair is necessary and to optionally perform the repair, the File Store Rescue Tool can be used. For more information, see Rescuing lost index entries for assets in the File Store folder of Elvis 6 Server. 4 April 2019: Updated the note in the introduction with information about deactivating the license in the previous installation when restoring the index in a new installation.